Beautiful painting of the 30/40 years. Original work, oil on isorel. 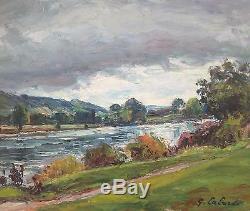 River by stormy sky in Normandy. Dimensions 48 x 33 cm (8p). Dispersion of a part of the bottom of workshop, very beautiful opportunity. Other works of the artist for sale. Thank you for your questions. 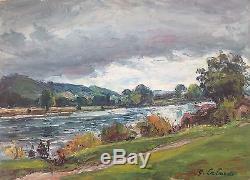 The item "gaston laborde tableau hsp rivière ciel d'orage en normandie peinture 30/40" is on sale since Thursday, March 9, 2017. It is in the category "art, antiquities \ art of the twentieth, contemporary \ paintings". The seller is "jicky28" and is located in / in chapet. This item can be delivered anywhere in the world.